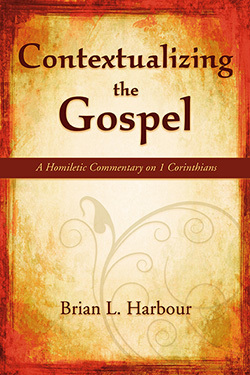 In Contextualizing the Gospel: A Homiletic Commentary on 1 Corinthians, Brian Harbour has responded to two deep needs within the church: the desire for “biblical” preaching and for help relating the church to a rapidly changing world. A commentary in the traditional meaning of the word — a critical explanation or interpretation of a text — Harbour examines every part of Paul’s letter and seeks to explain and interpret each passage. He provides a rich resource for those seeking the deeper insights of God’s word, who want to struggle with both the difficult and the simple texts, who want to know how God’s word—all of it—intersects with their lives today. Dr. Harbour preaches from his heart as he teaches from his in-depth study of the scripture. This commentary applies the truths from Paul’s letter to the Corinthians to the challenges of life facing today’s Christians. Dr. Harbour’s work is practical, based on thorough Bible study, and encouraging, based on a pastor’s loving care for his congregation. I commend this commentary as a useful resource for laypersons, for Bible teachers, and for preachers seeking to give practical counsel from the authority of the scripture. Dr. Brian Harbor offers to us in this contemporary contextualized pastoral treatment of 1 Corinthians just what we have come to expect from him for a generation. Generous in pastoral wisdom, apt in memorable anecdotes, accessible in narration of the text - these characterize his able biblical exposition. He joins the past historic situation of Corinth with the present situation of today's church in an energetic and engaging conversation. To merge the horizons of long ago with the horizons of today is no easy thing and he has done this in a fresh way. This book is truly a text message for right now. I have great respect and admiration for my friend, Dr. Harbour, and he has led several very successful churches for over forty plus years. I have always had a deep interest in 1 Corinthians, and as a Sunday School teacher, I see this book as an excellent tool and resource. It will help me in my efforts to share His word. Brian Harbour combines the best of critical scholarship with practical insights for weekly preparations. This commentary fills a critical gap between the library and the pulpit, offering contemporary application with depth and clarity. Have you ever puzzled over the Pauline letter known to us as 1 Corinthians? Have you ever pondered how this passage or that within the epistle might be preached with fidelity, clarity, and creativity? My colleagues, our students, and I certainly have. Fortunately, we now have Rev. Dr. Brian L. Harbour's “homiletic commentary” on 1 Corinthians to assist us in teaching and preaching this demanding, yet inspiring, apostolic missive. Perhaps you have had the good pleasure of hearing Brian Harbour the “preacher.” I have had the honor of calling Brian Harbour “pastor.” In Contextualizing the Gospel, this able preacher and adroit pastor with limpid, lively prose lays bear truths from this ancient text for today. Before preaching or teaching from 1 Corinthians, read this book, for it is an invaluable resource for studying and explicating one of Paul's most valued and valuable epistles. Professor of Christian Scriptures, George W.